I have written about ProFILE (Program for Integral Formation of Lay Leadership) twice before ProFILE #1 here and ProFILE #2 here. This is a four-part leadership retreat. We have been working with leaders from almost every congregation/mission in Colombia with the goal of strengthening lay leadership within the church. This retreat was themed Liturgy and Diaconal Service. 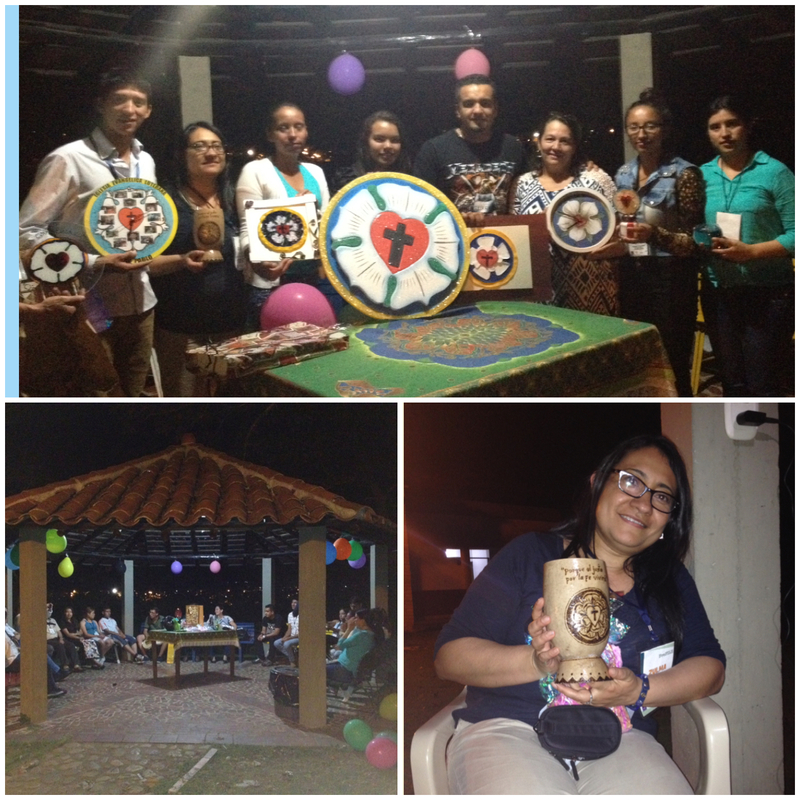 One of the goals of this group is to have each of the retreats in a different region of the country (the country is broken up into 4 regions where the Lutheran church has a presence), this retreat was in Bucaramanga, in the Eastern Region of Colombia. To keep with the theme of ProFILE; this will be another photo blog through the photos I took this past weekend. Our first activity (after the opening devotion of course) is always an ice breaker activity and name re-fresher. 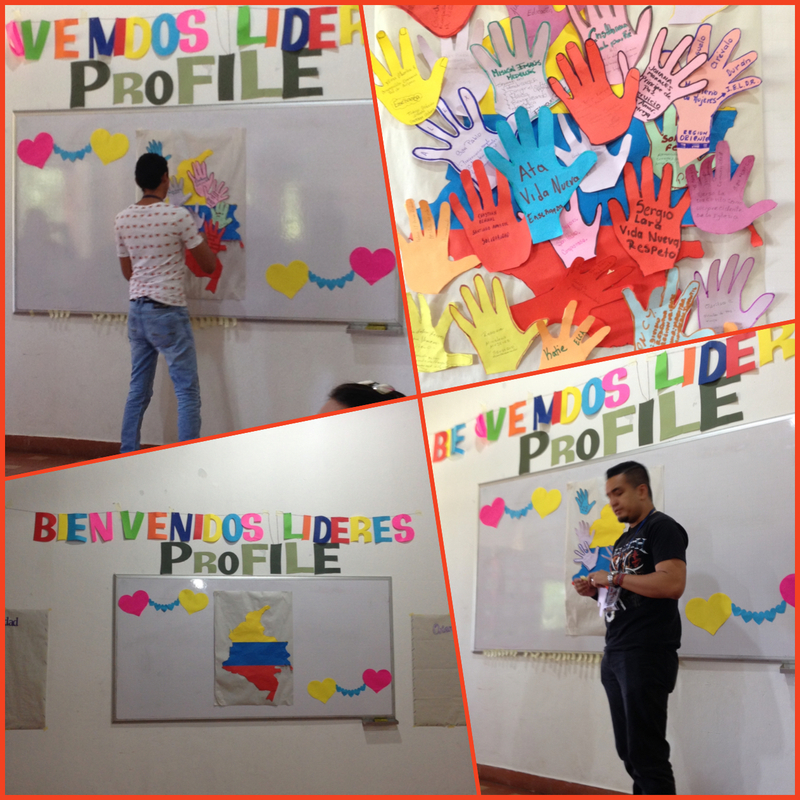 Before the retreat we created a large map of Colombia in Colombian colors - yellow, blue and red (bottom left photo). For the activity, everyone drew their hands, then they wrote their name, their church and what Diaconia means to them or how they are involved in Diaconal service in their congregation. Then everyone presented and glued their hand to the map. 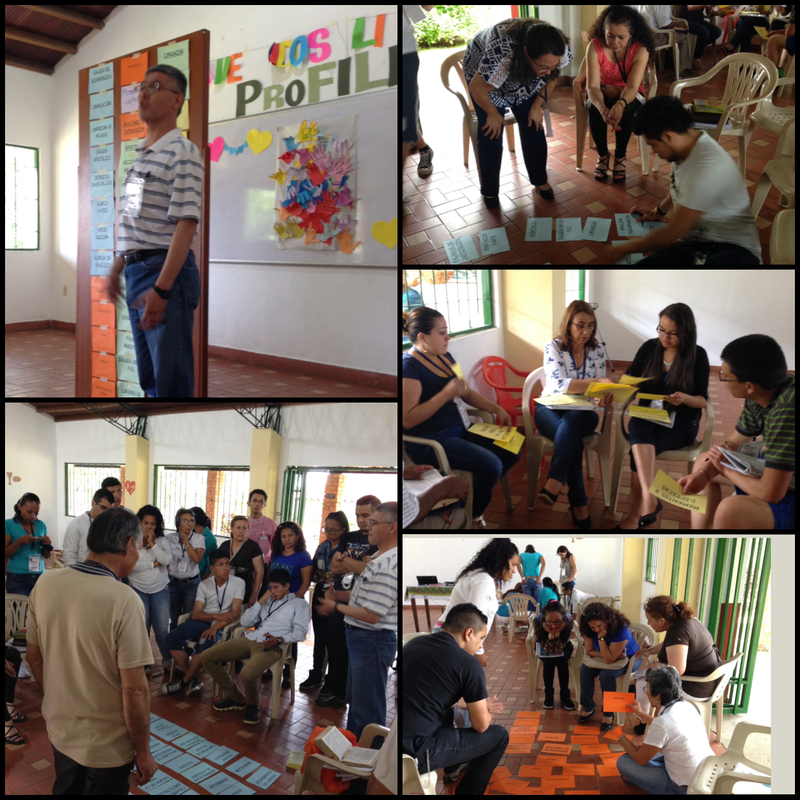 This was an interesting activity to learn what people understood Diaconia to mean and how they are involved in the different Diaconal projects of their congregations. Upper left photo is Cristian gluing his hand on the map, upper right is a shot of all the hands at the end - filled the map and you can barely see it (can you see my hand at the very bottom center of the photo? ), bottom right photo is Enrique presenting himself. The second activity we do, is a "test" of knowledge. We call it "what we bring" (what knowledge do the participants bring to this, and where are the gaps). This activity is always a game. One of the games I lead during several of the other retreats and workshops is Jeopardy (this was a first for ProFILE). This is a new game to almost everyone, and has been very fun to introduce and play. 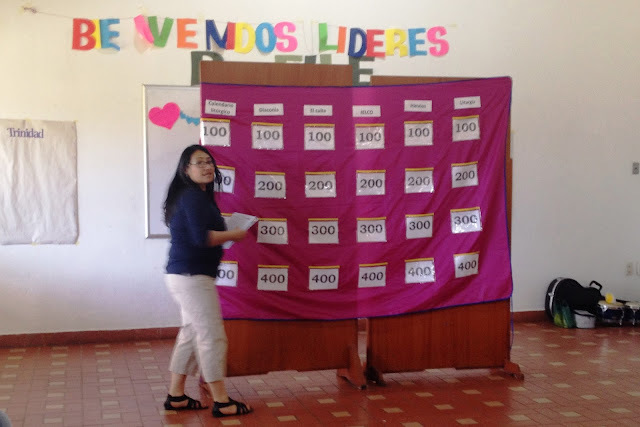 The categories for this game were: Liturgical Calendar, Diaconia, Worship, IELCO, Hymns, and Liturgy. This time the game was challenging, but still lots of laughs and really great conversation. 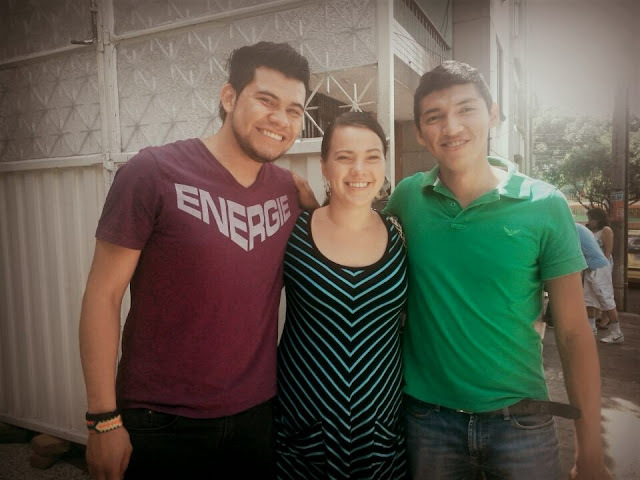 Next Pastor Jairo took over (he is the director of the Diaconia National Ministry of IELCO). He was our guest speaker for the retreat. The first part he talked about Liturgy, the importance of Liturgy, why we have Liturgy and why the order of the Liturgy matters. He is an incredibly dynamic speaker and very passionate about what he was teaching. It was fun to listen and learn along with everyone else. In the photos above the group broke into smaller groups to see who knew the order of the Liturgy. 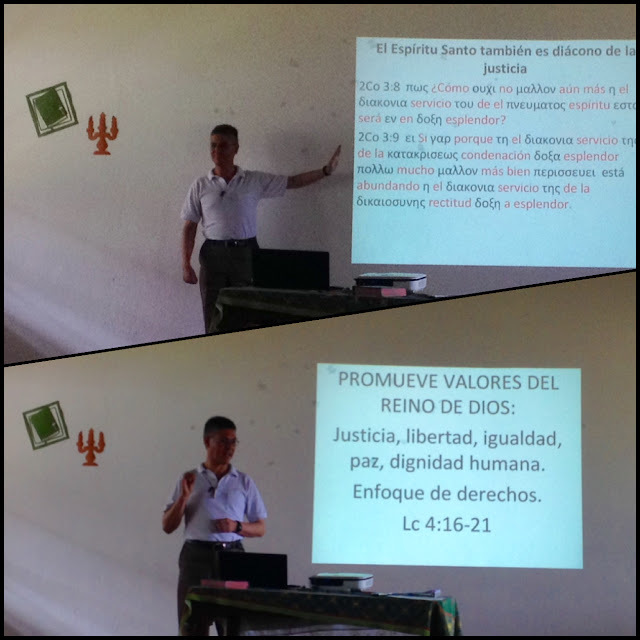 In the upper left and lower left photos Pastor Jairo is instructing the correct order of Liturgy. On the right side the different groups are trying to puzzle together the order of the Liturgy. Like I said at the beginning there were two themes for this retreat. The second theme was Diaconia/Diaconal Service. In these photos Jairo is teaching everyone a little Greek, and the history of Diaconia. In the upper photo is the Greek, and the problems or misunderstandings that happen through translating the Bible. I absolutely understand this concept, but boy was it difficult for me to try and have a Greek lesson in Spanish! In the lower photo Pastor Jairo is teaching more about Diaconia and what verses in the Bible support the churches participation in Diaconia and socially minded ministries. The slide in the lower photo says: "Promote Values of the Kingdom of God: Justice, freedom, equality, peace, human dignity. Focus on rights. Luke 4:16-21". Finally, every retreat needs to have a little fun. The group all got together Saturday night for a white elephant gift exchange (to celebrate love and friendship, Colombia's Valentines day, which happens here in September). In addition to the gift exchange, one of the homework assignments from the last retreat was to creatively make something with the Luther Rose (each congregation) to gift to another congregation (the gift came with the promise from the gifting congregation to hold the receiving congregation in special prayer). After the gift exchanges, there was the presentation of the Luther Rose Gifts - WOW! As you can see in the photo on the top, people use tons of creativity and made beautiful gifts for each other. In the bottom right is Zulma with a chalice made from the shell of a fruit with the Luther Rose burned into it. This was a gift to the Christian Formation/Education department (where Zulma, Pastor Atahualpa, and I work) from the Church in Paz de Ariporo. The bottom left photo is the gazebo where we held the celebration and everyone seated and enjoying the evening together. Again, this was a wonderful retreat. I really enjoy this group and look forward to our final retreat in December.